EVANSTON — Saturday was a proud day for the Northwestern Athletic Department as men’s basketball head coach Chris Collins was officially inducted into the Northwestern Hall of Fame. 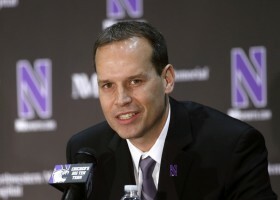 Following the team’s win over Eastern Illinois University, Collins was hailed as the greatest head coach in Northwestern history and immediately nominated and accepted into the hall’s storied annals. After saying “Thank you” sixty-two times, Coach Collins finally calmed the crowd enough to speak.